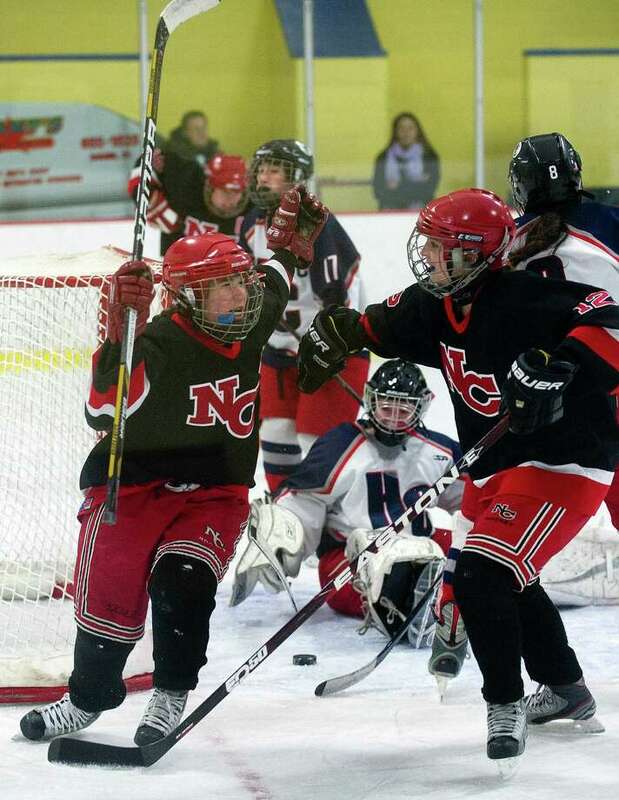 STAMFORD -- New Canaan girls hockey coach Rich Bulan and his staff had a great idea recently. Why not, they thought, keep Olivia Hompeon the ice more? "Olivia tired is like everyone else at full strength," Bulan said. And so, with Hompe, one of the greatest players in state history, playing 44½ minutes out of 45 in Saturday's state championship game against Hall-Conard, the strategy worked ... even if Hall-Conard did a great job containing her. "She only got one against us," Hall-Conard coach Bruce Wooley said proudly after New Canaan's 2-0 victory. "She's an exceptional athlete. They wanted her out there the whole game and it worked." While Hompe's one goal helped, it was three fewer goals that she usually has a hand in during NC games. The senior, who finished the season with 61 goals and 44 assists, averaged more than four points per game this season. And don't forget the 75 goals she scored last season and the 67 the year before. Saturday she was moved to defense and she and fellow defenseman Madzie Carroll rarely got a breather. "I think I came over to the bench once for 30 seconds," Hompe said. "Even if I was tired, I wasn't coming off the ice today." "We figured, why not let her play 80 percent of the time instead of 50," Bulan added. "I guess it turned out to be more like 99 percent." Hompe's goal, along with a goal and an assist by freshman Catherine Granito helped New Canaan to its sixth state championship in the eight years the event has been held. The Rams (24-1) were runners-up the other two years, including last season to this very same Hall-Conard team (19-5), 3-2 in overtime. "I knew after beating them last year that they would be tough to beat today," Wooley said. Yes, the Rams were out for revenge. But a greater dynamic was it was not only Hompe's final game in red and black, but her final hockey game ... Ever. Hompe, who will be attending Princeton in the fall, chose to play only women's lacrosse at the collegiate level. Put those factors together and it certainly spelled trouble for Hall-Conard on Saturday. "The girls," Bulan said, "weren't going to be denied today." Hompe's teammates obviously wanted to send her, as well as fellow seniors Madzie Carroll, Corbett Ripley, Kit Clemente and Kylie Glover, out as winners. "It's hard," Hompe said. "I played so much these last four years for New Canaan, it's just amazing it's over. I'm going to miss it so much. I'm really sad that I won't be playing anymore." Granito, who set a state scoring record for freshman, scored her 33rd on a rebound 3:46 into the game. Hompe then knocked a centering pass from Granito past Hall-Conard goalie Lauren Sorgio (40 saves) with 58 seconds remaining in the second period. New Canaan goalie Nathalie Deney picked up her sixth shutout by stopping 18 shots. Records: Hall-Conard 19-5, New Canaan 24-1. Goals: NC--Catherine Granito, Olivia Hompe. Assists: NC--Corbett Ripley, Amelia Carroll, Granito. Goalie saves: HC--Lauren Sorgio 40; NC--Nathalie Deney 18.